 Coil were an influential English experimental band formed in 1982 by the late John Balance (AKA "Jhonn Balance") and Peter Christopherson. They released their debut album, "Scatology" in 1984, followed by: "Horse Rotorvator" (1986), "Gold Is the Metal with the Broadest Shoulders" (1987), "Love's Secret Domain" (1991), "Stolen & Contaminated Songs" (1992), "Astral Disaster" (1999), "Musick to Play in the Dark Vol. 1" (1999), "Queens of the Circulating Library", "Musick to Play in the Dark Vol. 2", "Constant Shallowness Leads to Evil" (all three released in 2000), "The Remote Viewer" (2002), "The Restitution of Decayed Intelligence" (2003), "Black Antlers" (2004), "The Ape of Naples" (2005) and "The New Backwards" in 2008. Founder member John Balance died in 2004 and Peter Christopherson died in 2010.